A Short History of the Beaconsfield & District M.R.C. 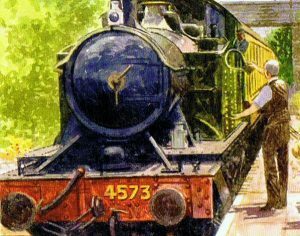 The club was formed in the summer of 1962 and in fact started in Marlow – at first being called the “Marlow Model Railway Club”. The adverts for the club in the model press attracted around 20 members to the first meeting. The first Clubroom was a garden shed, so there was not much room for members to do anything but stand and chat about railways (both real and model) – even to this day there are some members who seem to prefer this “social” side of membership to actually getting down to building anything! After 6 months the club moved to another, larger, shed – but it was still in a member’s garden. At that time a formal committee was elected and one of the first tasks was to change the name to the 4573 M.R.C. 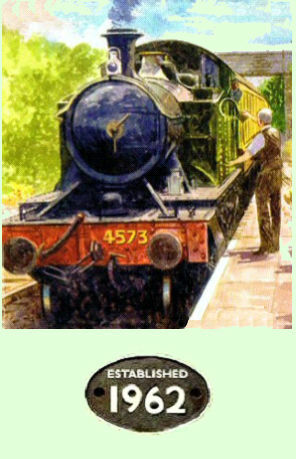 as the club had acquired that cast numberplate from a G.W.R 45xx Class engine. It is said the number represented the “popular” scales at that time – 4mm, S gauge, 7mm and 3mm.The clubroom being far from ideal saw members start to drift away and by 1965 there were only 6 left. The club was close to folding when a new member Jack Humphrey arrived. Through his employer, within two weeks the club was offered the use of two stables in Beaconsfield – which the club accepted and moved in. It was here that the first club layout was constructed. 12 months later Jack arranged for the club to move into superior premises – which we exclusively occupy to this day (although the current main clubroom is not the original building – more about this later). At this time a decision was made to change the club’s name to “The Beaconsfield & District M.R.C.” The old “4573” name was retained as the club’s logo, which still remains the case. Jack is widely regarded as the “Father” of the club in its current guise. The club grew again and the numbers built back up to the 20 mark – a number which has remained reasonably constant despite all the natural coming and goings of members over the years. It seems that new members either move on quickly, or stay for many years – many have been members for 20 years or more and our current Club Secretary has been a member since 1971. We have also sadly seen several members depart for the “great marshalling yard in the sky” over the years, including Jack, all of whom are still fondly remembered by those who knew them. The club held its first exhibition in 1968 at the Burnham Halls in Beaconsfield, which became an annual event at the same venue for many years. The 1980s saw the exhibition move to better premises in the town – at the Curzon Centre. By the 1980s this was becoming too small, so we moved to the Beaconsfield School in the 1990s. In 2008 we moved to the Beaconsfield High School, then in 2014 we moved back to the Beaconsfield School as it could now offer increased space for the exhibition and this is where our exhibition will be held again this year. The other significant change has been that in 2015 we moved the date of the exhibition from it’s traditional “first weekend in October” slot to “first weekend in July”. This move of date seems to have proved popular with the public, layout owners and traders, so will continue for the foreseeable future. The club has constructed many layouts over the years, both permanent and exhibition, with club members also constructing their own exhibition layouts at home, which have often been exhibited under the club’s banner. The original main clubroom became the unfortunate victim of subsidence in the 1990s and partly collapsed. It was almost the end of the club, but through negotiation with our landlord a deal was struck where we contributed towards the cost of a replacement, modern construction, hut, which was only slightly smaller than the original. In late 2015 work was completed, in partnership with our landlord, to demolish the life-expired “Nissan” style hut, which had housed the “O” Gauge layout, and replace this with a modern wooden construction building of the same size. Whilst the foundations, concrete base and basic building were constructed professionally, all the interior works and external decoration was carried out by club members. This has resulted in us now having the best overall facilities in the club’s history, with two modern buildings to house our various layouts/projects. In addition to these two main clubrooms, the club also has use of both a separate workshop and separate storeroom. The club is proud of its heritage and the flag it flies for Railway Modelling in South Bucks – we may not be the most skilful bunch of modellers around, but we do strive to be the friendliest! 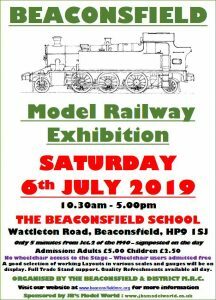 The club celebrated it’s Golden Jubilee in 2012 and is looking forward to many more years serving Railway Modellers in Beaconsfield, South Bucks and the surrounding area.